Every year, I run in the Lycée Français de Singapour for the 4th graders (9-10 year olds). Different classes chose to explore different techniques(last year, there were 5 of them!) . Some of the results are shown here. I have run various workshops for kids at the STPI. A particularly successful one was the Matisse Jazz Print workshop, in June a few years ago. How Much? $60 per pax. Includes all material. December 2012 : Make your own Greeting Cards! parent/child workshops! 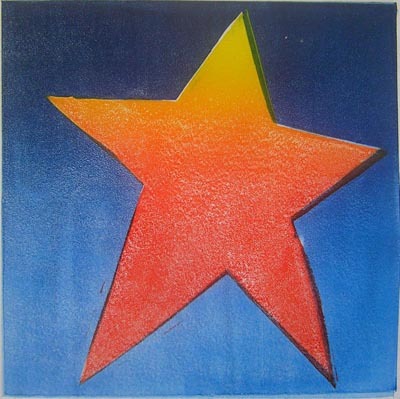 Starting with simple materials for relief-printing, you can obtain stunning results like the print of a star above. Older children will be introduced to the technique of etching on milk cartons, which allows delicate drawings to be reproduced and displayed in front of a lighted candle. And if we still have time, we will use silk-screen to produce many Snowman postcards. In any case, expect a session of experimentations, discoveries, and beautiful results. Saturday 15th December 9:15 – 11:15 for 10 year old onward. December 3, 2011, 9:15 – 11:15 am. Make your own Greeting Cards, a parent/child workshop! Using the technique of etching on milk cartons, make delicate drawings that can be reproduced and displayed in front of a lighted candle. July 4-8, 2011, 9.30 -12.30.Learn Printmaking for children from 6 years old. Dec 1 – 5, 2008, 9.30 pm – 12.00 pm. Introduction to Printmaking (intaglio and relief) For children from 7 years old. Introduction to intaglio printing using materials such as acrylic plates, cardboard and found objects, and milk cartons.Children will also learn about Lino printing and other relief methods, as well as monotype. The workshop requires and independent mindset since students will be expected to work on their own chosen image. Recycled material is ideal for printing: anything flat and with texture will give great relief print. And then, there’s milk cartons…. each participant is asked to bring a variety of materials: recycled bits of cardboard, lace, cloth, string… and a carton of milk! Print your own design using a used milk carton! A technique related to etching (intaglio printing), which gives stunning results, such as these fish. For adult and children teams (4-7 years old) or for children alone (from 7 years old). Oct. 28-Oct 31, 2008, 9.30 pm – 12.30 pm. Introduction to Printmaking (intaglio) For children from 7 years old. Introduction to intaglio printing using materials such as acrylic plates, cardboard and found objects, and milk cartons. The objective of the 4 days is to understand this very ancient technique (usually using copper plates for etching) using modern materials. Of course, we will be using the press. Aug. 25-Aug 29, 2008, 9.30 – 12 noon. Introduction to Printmaking (relief and intagio) For children from 6 years old. 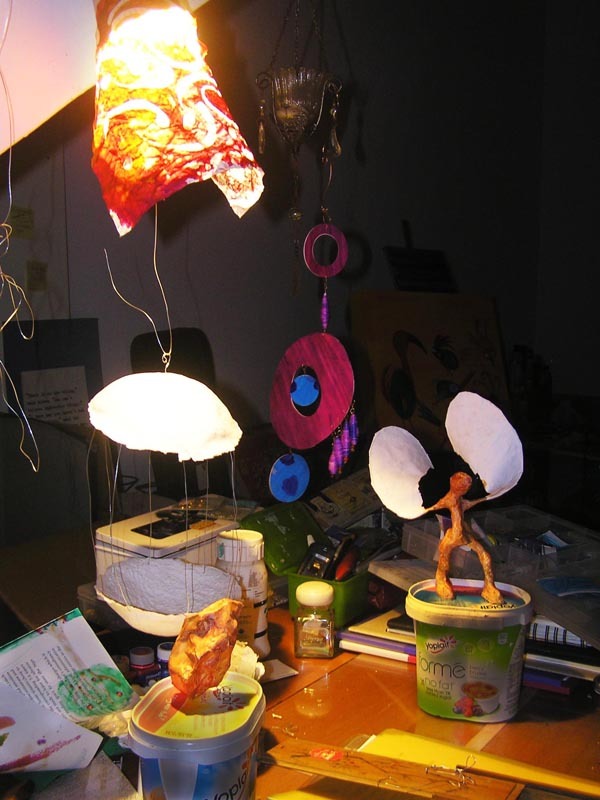 Once again, the studio in Seletar will be open for a week of exciting printmaking experiments – for children only! Beginners and intermediate students welcome. The workshop requires and independent mindset since students will be expected to work on their own chosen image. Understand how relief printing works. Use a variety of ready-made plates to print. Design your own plate and print it many times on the printing press. June 28, 2-4 PM. Jazz: Print your book like Matisse. From 7 years old. At the STPI. This workshop is a collaboration between the different participants, in a similar way to the June 3 Workshop. Like Matisse, each participant will take special care to prepare their own COLOUR to be used for their print. Each participant will walk off with a copy of the collaborative printed book. Fees: $65. Contact STPI directly to register. June 3, 2-5 PM. Print Your Own Book. From 7 years old. In this workshop, we use foam to make a “mobile” printing plate. The plate is printed slightly differently every time, so that the story can unfold from one page to the next. Confused? Don’t worry, just come and explore printmaking and the joy of using ink rollers, rolling out ink all over the table, using a real printing press, and coming home with your own printed book! May 27, 2-5 PM. Introduction to Printmaking: printing with recycled material. For children from 7 years old. A good complement to the Print your Book workshop (June 3), it uses the same basic technique but gives more space to exploration. May 24, 2-4 PM. Collage Printing, following Matisse. STPI. For children from 7 years old. After looking at some of Matisse’s later days colour cut outs, participants will go about designing their own simplified shapes, colours and compositions. They will then use the press to print their composition. Contact STPI directly to sign-up. I am the Education Curator at the Freedman Gallery and I work with grade school children from the community. I have been looking for a printmaking technique to use with children and I’d like to try your milk carton process if you would share the details with me. We’ve worked with meat-packing trays in the past and I’d really like to try something new. I also like the recycling aspect of this technique. Do you mean 7-12 year old children? The technique is suitable for them. The technique requires the use of a press and thick water-based “etching” ink, i.e. an ink more viscous than your usual “block printing” ink. It relies on the fact that milk-cartons (juice too) are made of 2 layers: one is waxy and water-repellent and covers a cardboard and more absorbent layer. As you scratch the waxy surface with a needle (or equivalent tool), the underlaying absorbent layer is revealed. Then, just like for a collograph or an etching, you spread the ink on the carton, and remove it with soft paper. The ink stays in the scratched part of the design. These will print. The quality of the material is limited and you will probably be only able to print 2 perfect copies. The next ones are blurred. After 5, the waxy layer will not allow any more printing. For the ink, I am using a newly-available, China-made, Marie brand “etching ink”. Good luck and let me know if you need more details.